So, I had a week off work. And it was wonderful. Relaxing. Non-stressful. I got a fair amount of things done. I made one carnivorous and three regular terrariums. I did some stitching (counted cross stitch) and kitted up a couple more charts. I made some small progress in the chaos in my room. 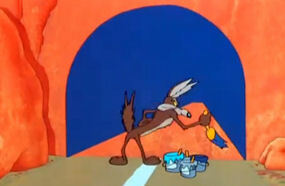 I’m not exactly seeing the light at the end of the tunnel yet, but at least I’m aware that there’s an actual tunnel and not a painting by Wile E. Coyote. And most importantly I have taken a few minutes each morning before starting my day to spend time opening up to the gifts of the Gods and to thank Them. And I have remembered – or been reminded – how much that helps. I ask that Apollo fill me with His presence so that my presence may be one of warmth, healing and enlightenment to all with whom I come in contact. And I ask for protection, spiritual as much as physical. And I give thanks for the reminder – a shaft of sunlight, a brush of breeze – that I am not alone, that my Gods are there with me. And I ask Hermes to guide me safely through the darkness and back into the light so that I don’t lose my way. Those brief moments before I enter the doors help me find my center – and make it easier to return to it when it gets lost during the demands of my job. And when I step outside again at the end of my shift those few moments taken hours before make it easier to leave the darkness of the spirit behind me. Posted on August 7, 2013, in Pagan, Uncategorized and tagged daily ritual, finding time, hobbies, spirituality in daily life, writing. Bookmark the permalink. Leave a comment.